Danny Ocean isn’t really a fictional character, he is Frank Sinatra. Believe it, his boys would do anything for him. Except Dean, he was the only one who ever said no to old blue eyes. Frank really dug Dean’s truthfulness. 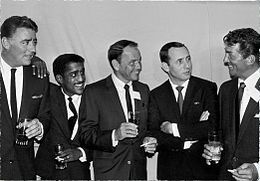 This performance was on June 20, 1965 featuring, Frank Sinatra, Dean Martin and Sammy Davis, Jr. Johnny Carson (known for The Tonight Show) served as the emcee, filling in for Joey Bishop who had hurt his back. Peter Lawford was originally cast as Alan A. Dale, but due to a falling out with Frank Sinatra, Bing Crosby took over the role. At the time, Lawford’s brother-in-law was President John F. Kennedy and Lawford had arranged for The President to stay at Sinatra’s home. However, because of concerns over Frank’s ties to the “Mob”, the plans were scraped. Over 50 years later, Frank Sinatra, Dean Martin and Sammy Davis, Jr. are still the coolest guys to ever hit the Vegas Strip! This entry was posted in Classic Films, Film History, Musicals and tagged 60's, Angie Dickinson, Dean Martin, Frank Sinatra, Jr., Jr. Humphrey Bogart, Las Vegas, Ocean's 11, Peter Lawford, Rat Pack, Robin and the 7 Hoods, Sammy Davis. Bookmark the permalink.